There are many Jamatkhanas in India, a handful of which have celebrated over a century of existence. In this article we will explore three of India’s oldest Jamatkhanas, including their histories, architecture, and the role they play in the community today. The ornate Kalupur Jamatkhana has an exterior decorated with beautiful oriel windows, arches, and carvings. The city of Ahmedabad lies on the banks of the river Sabarmati in western India. Once known as 'karnavati’ it was only after the reign of Ahmed Shah I in the 15th century that it assumed the name Ahmedabad, or the vernacular, Amdavad. Ahmedabad is a historic city, with ancient buildings, gates, and pols (streets). One of these buildings is the Railwaypura Jamatkhana, known today as Kalupur Jamatkhana. Upon reaching the main entrance of the Jamatkhana, above the door, the name of Mawlana Sultan Mahomed Shah is carved on stone in a semi-circular shape. It was during his Imamat that this Jamatkhana was built. The ornate, multi-story building has an exterior decorated with beautiful oriel windows, arches, and carvings. The engravings and etchings on wood and stone used for the construction of the building reflect the tradition, context, and local culture of Ahmedabad in the 18th and 19th centuries. 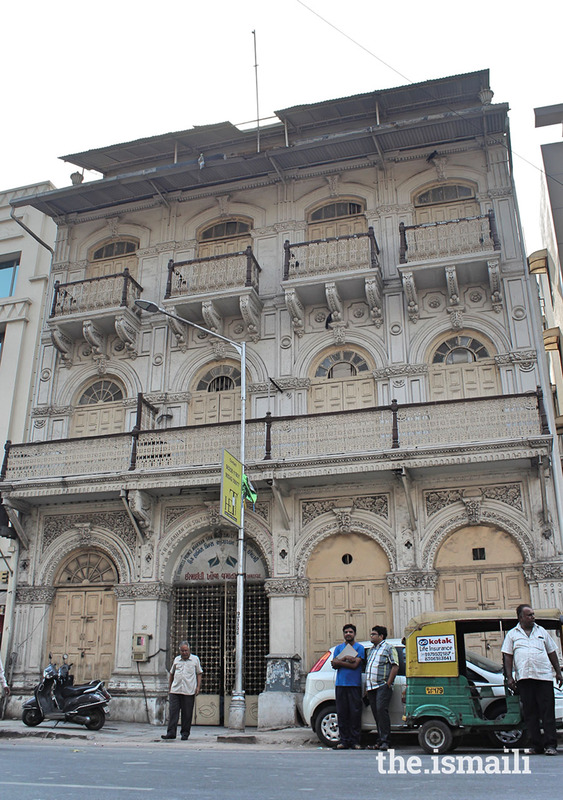 Today, this Jamatkhana serves as a vestige of the South Asian Jamat’s history. For many, entering this Jamatkhana gives rise to a feeling of pride. So note in your diary the name of ‘Kalupur Jamatkhana’ and the next time you get off at Ahmedabad Junction (Kalupur railway station) make the short walk to this Jamatkhana. Junagadh is an ancient Nawabi state in the foothills of Girnar and a busy metropolis of today's southern Saurashtra, which has been home to a large Ismaili community for many years. There are two Jamatkhanas in Junagadh: Karimabad Jamatkhana and Dhal Road Jamatkhana which is thought to be over 100 years old. Born in 1788, Ismailbhai Gangji, who received the title ‘Vazir of Kathiawad’ by Mawlana Hasan Ali Shah for being a pillar of progress in the community, played a vital role in the reconstruction of the iconic Dhal Road Jamatkhana. Although he was a high-ranking officer under the Nawab’s rule in Junagadh, he was regularly seen amongst members of the community in the Jamatkhana. Dhal Road Jamatkhana is about one kilometre from Junagadh's central bus station and the railway station road. The Khojawad, an old Ismaili settlement, is only 800 meters away. The architecture of Dhal Road Jamatkhana is similar to the old buildings of Khojawad and other local buildings such as Diwan and Circle Chowk, Bahauddin College, Manjevdi Darwaja, the railway station, and other traditional Nawabi constructions. The craftsmanship of its walls, semi-circular doors, windows, pillars, arches, and sculptures are reminiscent of the Nawabi buildings of the era. The entrance of the Jamatkhana is a high half-circular wooden door. Inside, a staircase on the left leads to the main Jamatkhana courtyard. In front of the courtyard is the prayer hall, where the Jamat congregates for morning and evening prayers. The Religious Education Centre and institutional regional offices are located beside the prayer hall. Even today, more than a century old, the Dhal Road Jamatkhana is redolent with the beauty and serenity that makes it an ideal place of gathering and worship. Indeed, seeing this historical heritage is a great privilege, so make sure to visit when you are in the vicinity. Built at the beginning of the 19th century, the Darkhana building is an interesting collage of European and Indian architectural elements structured around a courtyard. The architecture is a hybrid of Victorian styles, mixed with other European elements, as was fashionable in pre-independence Bombay. However, being structured around a central courtyard, it evokes some affinity to more traditional Islamic buildings. The building is a three-storied structure, punctuated by a clock tower on the northeastern corner. The tower is an elegant structure with a square base form, which becomes an octagon at the higher level, creating a balcony within, and is roofed by a traditional Islamic dome. It holds a clock on its upper level, making it a recognisable landmark in the area. Due to these beautiful architectural features, Mumbai Heritage Conservation Committee listed Darkhana Jamatkhana as an official heritage structure in 2012. The Persian word Darkhana, is composed of two syllables, dar and khana. The preposition ‘dar’ means in, and ‘khana' means house. Being the first Jamatkhana of Mumbai, and the first Darkhana in the world, the structure is a heritage building of interest for the entire Ismaili community. Prior to Mawlana Hasan Ali Shah’s arrival in Bombay in December 1846, a Jamatkhana did exist in the southeast portion of the present Darkhana complex. The presence of the members of the Jamat and the already existing Jamatkhana in Bombay lead to the choice of this site. The first railway line was started between Thane and Bombay in 1853. Many of the major infrastructure projects of the city of Bombay were also completed before the end of the 19th century. This started attracting people from rural areas to the city of Bombay. Members of the Jamat started settling in Bombay particularly in the Dongri – Mandvi area, because of its proximity to the Old Harbour and the oldest goods depot of the Great Peninsular Railways, which was the main trading centre. Many prominent Ismaili traders, exporters, and importers had their offices on Samuel Street, then known as Khoja Mohalla, neighbouring the Darkhana building. This lead to an increase in the population of the Jamat and therefore development of the complex. Over the years, the building has grown and transformed to accommodate the different needs of the Jamat. First were the prayer and social halls, then shops, council offices, a multipurpose hall, and a secular girls’ school. In 1925, the clock tower was constructed on the northeastern side of the building and the clock was installed in 1935, with the clock donated by the Moloo brothers of Zanzibar. Currently, the National Communications team conducts heritage walks around Darkhana on designated Sundays. The walks allow the Jamat, especially the youth, to learn more about the iconic structures of Darkhana, Aga Hall, and Hasnabad Jamatkhana. So if you are in Mumbai on a weekend, participate in a heritage walk to get an insight into the structure and feel of this beautiful heritage building.